Award-winning journalist Brian McGrory goes head to beak in a battle royale with another male for a top-spot in his home, vying for dominance with the family’s pet rooster. Brian McGrory's life changed drastically after the death of his beloved dog, Harry: he fell in love with Pam, Harry's veterinarian. Though Brian’s only responsibility used to be his adored Harry, Pam came with accessories that could not have been more exotic to the city-loving bachelor: a home in suburbia, two young daughters, two dogs, two cats, two rabbits, and a portly, snow white, red-crowned-and-wattled step-rooster named Buddy. While Buddy loves the women of the house, he takes Brian's presence as an affront, doing everything he can to drive out his rival. 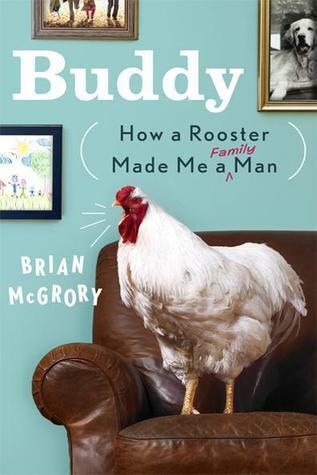 Initially resistant to elements of his new life and to the loud, aggressive rooster (who stares menacingly, pecks threateningly, and is constantly poised to attack), Brian eventually sees that Buddy shares the kind of extraordinary relationship with Pam and her two girls that he wants for himself. The rooster is what Brian needs to be – strong and content, devoted to what he has rather than what might be missing. As he learns how to live by living with animals, Buddy, Brian’s nemesis, becomes Buddy, Brian’s inspiration, in this inherently human story of love, acceptance, and change. This book is one of those feel-good reads that reminds readers that unconditional love comes in all species. Readers will laugh, cry and cheer their way through the life and times of Brian McGrory as he makes his way from divorced companion of "Golden extraordinaire" Harry, to the married family man and rival for their affections that he is to become. This book is proof that sometimes humans don't have all the answers, but we don't have to look far to find them. In fact, all we really have to do is look deep into the eyes of the pets that we love the most; and who often times in spite of ourselves, choose to love us. As humans, it is easy to forget that we are not alone in our capacity to travel the emotional spectrum from the giddiest of pinks to the most melancholic blues. It is nice to be reminded that whether they crow, bark, slither, or swim, or animal friends never lets us walk through our lives, emotionally or physically alone. As a lover of all animals- this sounds like a book I will love. This is my first time hearing about it and I have added it to my list! I could use a great feel good story about animals right now. Thanks for sharing! I've been tempted to raise chickens, so this sounds entertaining!